While Duluth’s East End is known for its mansions, one of the most striking Victorian homes in Duluth, the Prescott House, was built in West Duluth. The house exemplified the exuberance of the Queen Anne style, sporting three towers, an encircling veranda, stained glass windows, gables with bargeboards, a third-story balcony, patterned brick chimneys, finials, brackets, and many decorative wood panels. Prescott outfitted the interior with hand-carved panels of South American hardwoods, elaborate staircases, five fireplaces, inlaid floors, imported English earthenware plumbing, stained-glass windows, and zinc bathtubs. Even the closets boasted hand-carved wood panels. The house’s third floor was a grand ballroom, and in the first-floor reception room a gold-plated, flower-engraved wash basin awaited guests arriving by horse-drawn carriages after traveling dusty roads. D. Clinton Prescott was born in Illinois in 1841 and lived in northern Wisconsin where he founded the Marinette Iron Works to manufacture sawmill machinery. 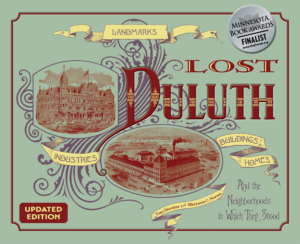 In 1890 he moved the plant to West Duluth, which was then being developed as a large industrial center. The Prescott family lived in the spectacular house until 1896, when they moved to Chicago; Marinette Iron Works closed two years later. Hansen Evesmith, one-time president of the Duluth Chamber of Commerce, moved in afterward and occupied the house until about 1910. In 1914 it was purchased by Thomas F. Feigh, who in turn offered it to the Duluth Catholic Diocese as a children’s hospital. It is unclear whether the house ever held the Thomas Feigh Hospital for Crippled Children. By 1916 the hospital operated within a new building at the head of Twelfth Avenue East, on the site of a former Catholic cemetery. Thereafter the house remained vacant and became known to area residents as the “Haunted House.” St. Louis County then took over the home, placing it on the delinquent tax list. Elmer J. Woefler bought the deserted house from the county in 1944 for $1,500 and dismantled it. Many parts of the house — including three of its fireplaces — were used in a house Woellfer built for himself along Highway 61 in Duluth at Rest Point. He also built some tourist cabins at that site with materials salvaged from the Prescott House, and Mrs. Woellfer kept the gold-leaf basin. By the 1950s, other homes had sprung up on the Prescott lot.